I’ve just ended my second semester as a graduate student in Bay Path University’s MFA program. (They’re a pretty awesome school – learn more about them here.) I have to say, the experience to date has been wonderful. The program I’m enrolled is for a Master of Fine Arts in Creative Nonfiction. Those of you who have read my work—which is chock full of elves and zombies—are probably wondering what in the world I’m doing in a nonfiction program. Since zombies didn’t suddenly become a real thing (or did they?) the answer is simple: diversification. Every writer I know who makes a living at writing—by “make a living” I mean that their primary source of income is their writing. They don’t have day jobs and write as a hobby, or self-publish poetry on the side. Mind you, there’s nothing wrong with day jobs or self-publishing, or poetry for that matter, but I’m talking about the people who wake up, write for eight hours, submit, rinse, repeat. I’m talking about when writing is your job. Why? Because that’s the job I want. I like writing. I’m good at it (or not, depending on which reviews you read), I write fast and well, and writing makes me happy. That last bit is really the most important aspect of the equation. For longer than I’m going to admit in this post, I’ve worked for Fortune 100 corporations, making medium-sized bucks while the life was slowly being siphoned out of me. Since life is far too short to spend it as a dried up husk, we’re giving this full-time writer thing ago. After all, if you find a job you love you’ll never work a day in your life, right? I hope? Which leads me back to, why nonfiction? If you go out and research average pay rates, you’ll notice an alarming trend: professional pay rates for fiction are around 6 cents per word, which means that a 1000 word fiction piece would earn around $60. However, rates for nonfiction are much higher, around one dollar or more per word. Of course, this is just one example, but across the board nonfiction pays better rates, and this is good for me. While I have no intention of ever leaving fiction behind, writing nonfiction is a way to increase my income while simultaneously expanding my readership. Again, diversification is the key, whether you’re writing fiction or nonfiction. So what is creative nonfiction? When most hear the term they assume it refers to memoirs, but there is so much more to this category that just idle reminiscing. Also included are reviews of film, theater, and books; lifestyle and other cooking articles; and many parenting magazines and websites. Basically, whenever you’re using your fiction writer’s toolbox to convey a nonfiction theme or idea, you’re working in creative nonfiction. In fact, this very post is creative nonfiction. Honing your craft – Writers are always being told to hone their craft, to have a daily word goal, et cetera. In this program I’m not only writing many pieces, I’m writing things that I never would have attempted on my own. Critiques from classmates/professors – I have the opportunity to have my work critiqued not only by my peers, but by professionals in the field. Is feedback always easy to take? Not in the least. But it is a necessary step toward improvement. Literary community – The writing community is small, and seems to get smaller every day. I’ve already made wonderful connection in the nonfiction community, and let me tell you, in publishing connections are everything. I’ve already gotten so much from this program, and I’m only one year into it. The work is hard, but good, and I’m being forced to examine my writing like I never have before. I can’t wait to start my next course. Are any of you interested in writing courses? Have you experienced any great programs, such as the one at Bay Path? Let me know in the comments! Don’t forget – this giveaway is still running! Have you entered? From @limitlessbooks! 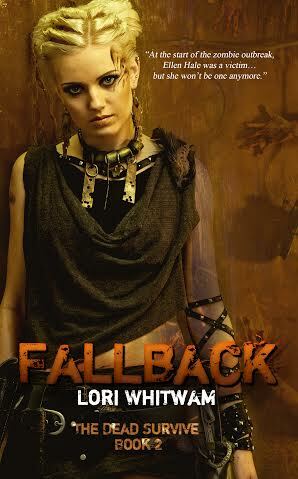 FALLBACK by @ripleygold is LIVE! expects me to walk into the woods on a dirt road that is God knows how long. having a panic attack, and I haven’t even made it to the camp yet. an intelligent woman with a doctoral degree, I remind myself. You can do this. already on the side of the road waiting for me. wardrobe. Work attire and lounging outfits for around the house are about it. caught dead outside of my home in one of my lounging outfits. conditions. I’ll be lucky if I don’t turn an ankle. end of the trail yet. few steps at a time I should make it there before dark. I’ll be in a bit of trouble. afraid when I finally remove my shoes my feet will be bloody as well. What was I thinking packing so much stuff? I was thinking I’ll be here an entire month and I need reading materials. and no water and the sandy road. career this year. I was finally promoted from Associate to Full Professor. off the mortgage on my house. and I’m sitting in the middle of the woods helpless to do anything about it. having a career upon my return from this journey into the wilderness. it’s shaded, but I’m too exhausted to move. the driver over, but to no avail. My arm won’t lift high enough. screeching halt, reverses and heads back towards me. out of the vehicle. The driver is a young, petite woman of Asian descent. man. She’s wearing well-worn jeans, black combat boots and a green Army jacket. “I’m aware of that.” My voice is weary. presumably for me to place my luggage in the empty truck bed. be able to lift the suitcase into the back of the vehicle. she slams the tailgate of the truck closed. marches over to the driver’s side of the truck and hops in. particularly in my dress and heels. “Are you coming?” She glares at me again. She’s very good at glaring. Despite her small stature she’s quite intimidating. buttocks which propels me enough that I’m able to climb into the seat. truck, leaps into her seat with the ease of a rabbit then slams her door shut. we head down the dusty road toward the camp. what appears to be a main building. It has a placard which says: The Wild Way Administration. truck bed and tosses it on the ground. the truck like a frog, and drives somewhere behind the administration building. of value to anyone but me. of the other smaller cabins scattered about the heavily wooded property. try knocking, then pounding, but to no avail. The place appears to be deserted. American woman was, so I wasn’t able to get him to commit to a specific time. distance from this one, several hundred yards at least. here for a while until someone appears, or I figure out something else to do. when I glance at my watch I realize only twenty minutes have actually gone by. off the roof and nearly hit me. stomping—right above me. Is it possible for a bear to climb on a rooftop? woman who gave me a lift in her truck? “Hello?” I shout when the hammering stops. he does doing anything else. teams like the one that killed Bin Laden. vocations for this man: killing bears or killing Bin Laden. a designation for someone who has obtained a research doctorate such as a Ph.D.
before he removes his hand. laugh so easily. I’m immediately suspicious of them. smirking, which makes it worse. The signing will feature over sixty authors, cover models, and other literary luminaries! And did I mention that it will be held in the Grand Pequot Ballroom? For more information, or to purchase tickets, click here. I’m also still taking entries for my $10 gift card raffle – Just post a review for The Virgin Queen, book 2 in my Chronicles of Parthalan series, then go here to enter. Click here to learn more about The Virgin Queen, and *hint hint* I do happen to have some review copies available. Just sayin’. Speaking of Parthalan, check out this amazing map of the realm! More to come on how you can win a copy. That’s all for now! How are you kicking off your summer? Let me know in the comments!